Click here or the cover above to enjoy the May 2018 Edition! Spring is in the air and Summer is right around the corner and we’ve been busy at Americana Outdoors. In March, we had the opportunity of a lifetime to travel (and travel and travel!) to New Zealand with Thompson/Center Arms to hunt for Red Stag and Tahr. Read all about it and check out the pictures (worth more than 1,000 words!) in this issue, and then look for this episode to air soon, too! Though part of us didn’t want to depart New Zealand, we knew there were Spring Turkey and some fishing waiting for us back home! 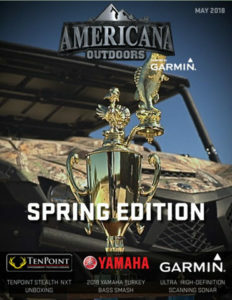 The team has been busy supporting the Cabela’s Collegiate Big Bass Bash presented by Berkley on Kentucky Lake, turkey hunting, fishing tournaments, testing new products like TenPoint’s new Stealth and Shadow NXT crossbow models, checking out Performance Center’s 686 models, as well as a lot more. 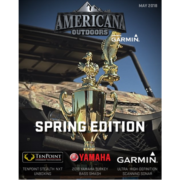 We’ve had the chance recently to spend time in the field and on the water with friends from Garmin, BoatUS, Purina Mills, and others, throughout the turkey hunting season. 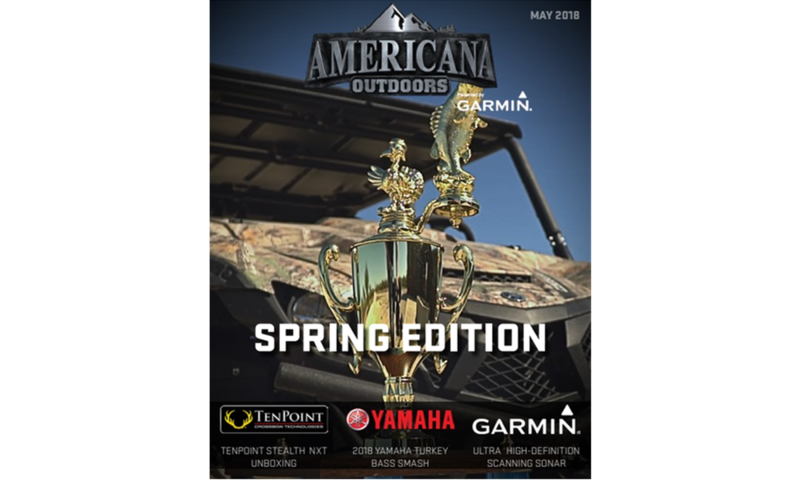 New on our list was the first annual “Yamaha Turkey Bass Smash” event out at our camp – though the competition was real, the fun, antics, and laughs were even more real. With writers and pros – including Jeff Kriet and Brandon Palaniuk – teaming up to turkey hunt and fish, we will have some great video to share and entertain. There’s so much more to talk about and you’ll find some great content inside this edition as well as lot more in upcoming episodes and on our social media sites! So for now enjoy and then get outdoors and play! Look forward to seeing you in the field and on the water!